Curt Schilling autographed 1990 Topps baseball card. Card has been authenticated by James Spence Authentications and encapsulated by Beckett Grading Services. Curt Schilling autographed 1990 Score baseball card. Card has been authenticated by James Spence Authentications and encapsulated by Beckett Grading Services. Johnny Bench autographed Perez Steele Hall of Fame Postcard. This card is signed in Blue Sharpie and is accompanied by a numbered authetication card from James Spence Authentications. Bo Jackson autographed baseball. Baseball comes with a gold base baseball holder. Authentication is provided by a numbered authentication card from James Spence Authentications. Don Drysdale autographed Perez Steele Hall Of Fame postcard. Don Drysdale is a deceased Hall Of Famer who was a teammate of Sandy Koufax and a member of the great Dodgers teams from the 1950's -1960's. It is signed in Blue Sharpie and is accompanied by a numbered authentication card from James Spence Authentications. Whitey Ford autographed American League baseball withthe Yankees logo. Baseball is signed Cy Young 62. Baseball comes in a ball cube accompanied by a numbered authentication card provided by James Spence AUthentications. Jim Hunter autographed Perez Steele Hall Of Fame postcard. This deceased Hall of Fame great signed this postcard Jim "Catfish" Hunter in Blue Sharpie. It is accompanied by a numbered authentication card from James Spence Authentications. 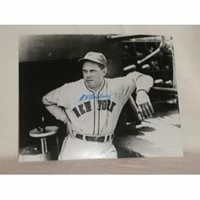 Bill Terry autographed 8x10 Black & White Photo. Comes with a letter of authentication from PSA/DNA authentication services. Ted Williams autographed 8x10 Color photo. Comes with a full letter of authentication provided by James Spence Authentications. Allen Iverson autographed basketball. Authentication provided by James Spence Authentications. Lefty Gomez autographed Gold Hall Of Fame postcard. It is signed in Black Sharpie and is accompanied by a numbered authentication card from James Spence Authentications. Lou Brock autographed Perez Steele Hall Of Fame postcard. It is signed in Blue Sharpie and is accompanied by a numbered authentication card from James Spence Authentications. Ernie Banks autographed official National League baseball. Baseball comes in a ball cube with a numbered authentication card from James Spence Authentications. Tony Gwynn autographed 1985 Fleer baseball card. Card has been authenticated by James Spence Authentications and encapsulated by Beckett Grading Services. Billy Martin autographed 8x10 color photo. Comes with a full letter authentication from James SPence AUthentications. Al Kaline autographed 1947-1966 series Exhibit card. Card is a tougher variation (kneeling pose) Exhibit card and is signed in Blue Sharpie. Comes with a numbered authentication card from James Spence Authentications. Hank Aaron autographed Perez Steele Hall of Fame postcard. This card is signed in Blue Sharpie and is accompanied by a numbered authentication card from James Spence Authentications. Al Barlick autoggraphed Perez Steele Hall of Fame Postcard. Card is signed in Blue Sharpie by this deceased Hall of Fame Umpire. It is accompanied by a numbered authentication card from James Spence Authentications.